The Internet is a source of connecting to the world. Ufone internet packages are worth for using internet whether it’s 2G or 3G. Ufone is providing a wide range of Ufone internet packages 2G 3G that is for daily, weekly and monthly time period. It has started its services in 2001. It was the third mobile operator to enter in Pakistan market. It’s basically a GSM cellular service provider. Ufone has subscribers over 24 million and they provide their best coverage to almost more than 10,000 locations in Pakistan. Ufone internet packages 2018 for 2G 3G are basically providing so much life easier offers to their customers by offering some amazing internet packages. In the modern era, people are constantly using Mobile data 2G 3G for using different social media platforms. In this case, Ufone is best to avail of its packages and enjoy the unstoppable speed of their internet. For your ease, all a person have to do is to dial *3# from your 2G 3G handset and get all the details to subscribe to best ever reasonable and great Ufone internet packages 2018. Let’s have a look at all the Ufone internet packages 2018 for 2G 3G handsets. They got the variety of it! You can choose by your choice. 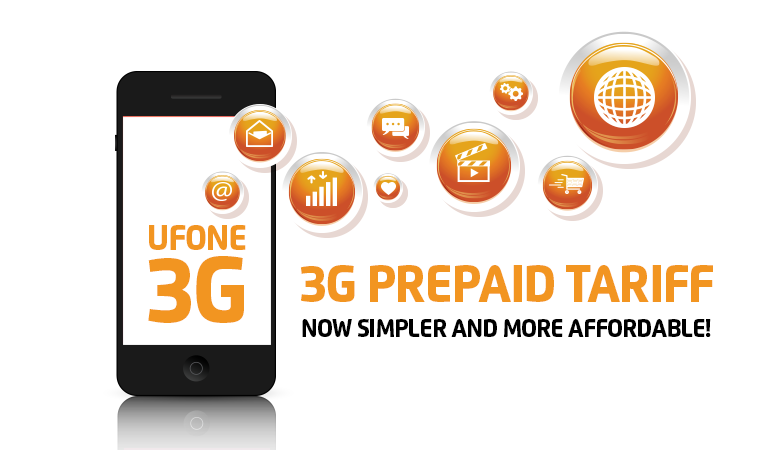 Below are the details of 4 Ufone internet packages 2G 3G for prepaid users. Free usage of Whatsapp, Facebook, Line, and Twitter in all daily bucket packages except Mega Internet Bucket. In the case of Mega Internet Bucket charges would be deducted from the available balance or super card whatever the person is using. Free usage of Whatsapp, Facebook, Twitter and, Line is available only on Weekly Light Bucket. facebook, twitter, line and, WhatsApp are totally free of cost. Ufone is also offering social data buckets for daily and monthly usage. you can use Whatsapp, twitter, and facebook for free. After the consumption of bucket volume, charges will be deducted according to the default tariff i.e. Rs.2.50 per MB at a charging rate of 512 Kbs. On the usage of 25 MBs, you will get 150 MBs free till midnight and so on. If U are using Mega Internet Bucket and Super/Mini Super Card simultaneously then usage against freebies will be charge from Super/Mini Super Card volume. Default internet rate on all prepaid packages is just Rs. 2.50 per MB at a charging rate of 512 Kbs. On the usage of 50 MBs, you will get 150 MBs free till midnight. To check remaining resources dial *707#. To check the remaining balance of the bucket, simply dial *706#. multiple subscriptions are allowed on Weekly Internet Plus. Any bucket can be subscribed by dialing *3#. Multiple subscriptions are allowed for all Monthly Buckets Packages. Streaming bundle offer is only for prepaid customers. All prices of each package are inclusive of taxes. dial *3# to subscribe to your desire monthly bucket. After using the bucket volume, charges will be deducted according to the default tariff i.e Rs 20 for the first MB and the user will get next 19 MBs for free. after this 21st Mb will get charged and then the next 19 MBs will be free again and so on. Volume usage will reset at 00:00 hrs. Everyday. All buckets are for postpay users only. Multiple subscriptions of the buckets are not possible. Maximum available speed would be provided to the bucket subscribers. Actual internet speed depends on different factors like web page access, location, time, device etc. This is all about Ufone Internet Packages 2018 for 2g 3g handsets. Above mentioned buckets are for prepaid and postpaid customers of Ufone. Deikhoo is honored to provide you with all the relevant info about Ufone internet packages 2018. If you want to know something more do let us know too.